Solar Powered Gadgets from Greatest Gifts. Check out our range of super Solar gadgets and gifts below, batteries not included!! Solar Powered Gadgets and Gifts. Free energy! Yes, FREE energy! Our range of Solar Powered Gadgets and Gifts cost nothing to run as they use a light source to generate electricity. No more batteries! Just let light do the work. Here's the science bit: The little strips on each gadget are called Photo voltaic Cells. These are made out of mainly silicon crystals that collect and convert Light Photons into Electrons. These electrons are what make up the electricity need to charge up and power the devices. These Photo voltaic Cells are becoming more efficient all the time and the potential is enormous. There are thousands of solar powered gadgets available and we have a huge range to compare and select from. One of our most popular solar gadgets and gifts is a solar powered birdbath that has no running costs and because it is sited outdoors it has ample supply of sunlight to power the pump that creates the lovely little fountain. There is a solar charged battery which can be used if there is insufficient light available. Another one for the garden is a Solar-Powered Mole Repeller that sits in the sunlight and plays its part in driving those pesky little moles away. This great little device regularly discharges a sonic pulse into the ground and this drives the moles away without hurting them. With it's built-in rechargeable battery pack it even works at night, just when the moles are at their most active. Staying with our outdoors theme a fantastic solar powered gadget is a garden wall light with a dusk to dawn sensor. This marvellous money saving gadget for home absorbs the precious light during the day and stores the power in its built-in battery pack. Then at night it automatically switches its light on and stays on all night until dawn arrives when it will automatically turn off again! It can operate for 8 - 10 hours and also has a manual on/off switch. For the kids there are many solar gadgets and gifts and one of these is a 6 in 1 solar robot kit. 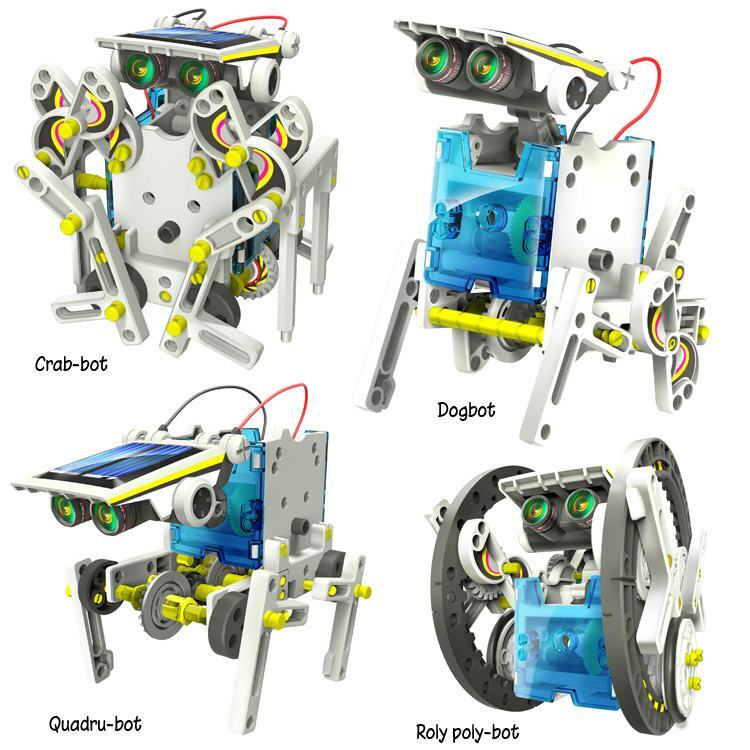 This is great fun as there are six different robots that can be assembled which means hours of real fun and learning for your kids. You can make a solar powered boat windmill or solar powered toy car, fantastic fun!